Driving difficulty: Easy on sealed road. Walking difficulty: Easy 40 minute return walk. Hazards: The grass growing at the side of the path near the fall is sharp edged. It cut my hand when I brushed against it. I have called these Pauanui Falls but they may have another name. 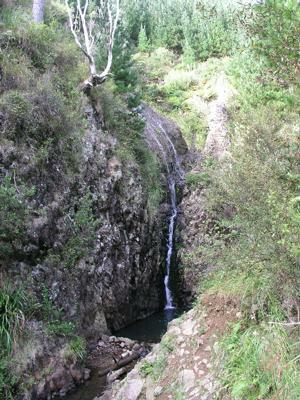 This is only a small waterfall, also because of the elevated viewpoint the photograph does not do it justice. It could be combined with a trip to Wentworth Falls. Driving towards Pauanui on the east coast of the Coromandel Peninsula we noticed a small parking area and sign board. We investigated on our return journey and found that it was the start of a path to a waterfall. 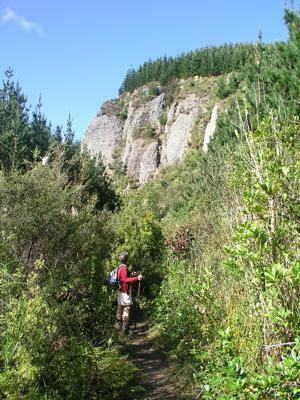 We returned the next day to investigate further, and found a narrow path leading to a small waterfall in a gorge.